Cooking up the perfect worksheet is getting easier. 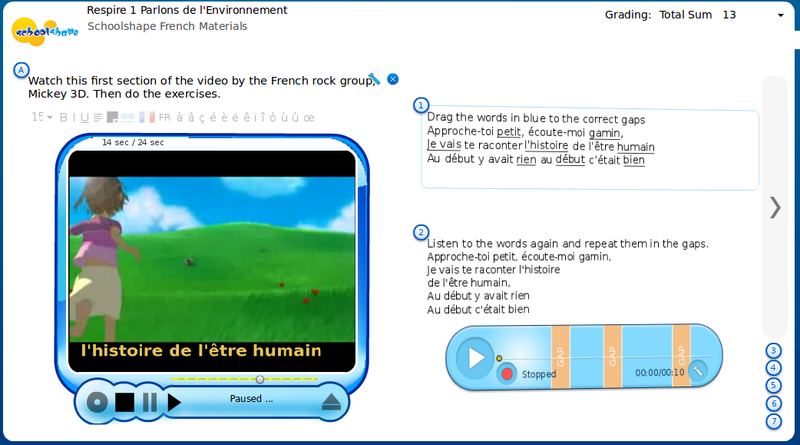 The latest editable online worksheets combine video stimuli and audio gapfill with more conventional exercises, such as picture labelling and cloze tests. The video stimuli hold the student’s attention whilst presenting grammar and vocabulary in context. The audio gapfill provides a ‘langlab-style’ environment, encouraging sentence building and providing plenty of speaking practice. An example of this can be seen in a French resource on the subject of the environment entitled ‘Respire 1: Parlons de l’Environnement’. (http://french-resources.org/sheet/13417) This presents the opening section of a computer-generated film based on Micky 3D’s 2004 hit, Respire. The lyrics and video are a powerful and provocative reminder of the inherent dangers of global pollution - a good starting-point for building vocabulary, sentences, questions and discussion on the environment. The short video introduction (there is a link to the full video in Exercise 6) contains some example lines from the lyrics, adding a little reading practice while listening to the words. Exercise 1 supports this by requiring the missing words to be dragged to their correct place in the text. Exercise 2 is an audio gapfill, requiring the students to listen and say the words themselves. Exercise 3 is a cloze exercise revising the immediate future using aller + infinitive. (There are also links to other resources on the present tense of ‘the irregular verb: aller’ for any students needing it). Exercises 4 and 5 encourage sentence-building by listening to an example and then repeating. Exercises 6 and 7 provide opportunities for further written and spoken language development, based on this topic. As with most recipes, we all like to make changes. Teachers wishing to add their own cookery can add, subtract or adjust the worksheet. They are invited to do so by making a copy and using the free online canvas provided on the Schoolshape platform.